12000 Bladen Oversized Accent OttomanIf you love the cool look of leather b..
12001 Bladen Oversized Accent OttomanIf you love the cool look of leather b.. There are plenty of reasons to love having the Loric ottoman nearby. An ove.. Looking for furniture with extra benefits? Patola Park ottoman delivers mor..
Why skimp on comfort and style? With the Palempor oversized ottoman, bigger.. The Marigny oversized ottoman with storage is another great example of form..
A little extra fluff could never hurt when it comes to the Gleason oversize.. The sleek mid-century lines of the Alenya ottoman are always in vogue. With..
Dimensions (Confirmed):Inches: 37" W x 37" D x 18" HMetric: 939.8mm W x 939..
Dimensions (Confirmed):Inches: 40" W x 40" D x 20" HMetric: 1016mm W x 1016..
Dimensions (Confirmed):Inches: 51" W x 51" D x 20" HMetric: 1295.4mm W x 12..
Dimensions (Confirmed):Inches: 51" W x 28" D x 17" HMetric: 1295.4mm W x 71..
Everyone loves getting something extra and the Geordie ottoman delivers wit.. Inches: 40” W x 23” D x 19” HColors:AshStyle:Casual.. Inches: 38” W x 38” D x 20” HColors:SlateStyle:Contemporary..
Sophisticated styling and an easy-care attitude are reasons why the Wilcot .. Inches: 32” W x 32” D x 21” HColors:IvoryStyle:Contemporary..
After supporting you all day, your feet deserve a break. Rest them on the S..
Dimensions (Confirmed):Inches: 29" W x 24" D x 20" HMetric: 736.6mm W x 609.. Inches: 30” W x 23” D x 20” HColors:TaupeStyle:Traditional.. Plush comfort and sleek, contemporary flair make for a pretty pair in the S.. The perfect accent piece for your homey oasis. Posh and practical Pitkin ot.. The Pantomine oversized ottoman speaks to those drawn to fresh, contemporar..
Dimensions (Confirmed):Inches: 42" W x 42" D x 21" HMetric: 1066.8mm W x 10.. 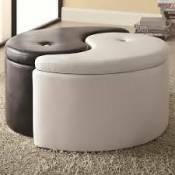 Putting the fun in functional, the Jessa Place ottoman just looks like a co.. Your cozy corner of the world isn’t complete without the Eltmann oversized .. Sporting a divine vine pattern that brings a fresh, organic element to your.. If you’re on the hunt for high style that strikes just the right balance of.. Breathing new life into a classic profile, the Ilena oversized ottoman is e.. Inches: 36.5” W x 36.5” D x 21.5” HColors:CharcoalStyle:Contemporary.. Inches: 36.5” W x 36.5” D x 21.5” HColors:WalnutStyle:Contemporary.. Inches: 36.5” W x 36.5” D x 21.5” HMore Dimensions:Ottoman 36.50" x 36.. Inches: 50” W x 29” D x 18” HColors:CharcoalStyle:Contemporary.. Prop your feet upon the luxuriously comfortable Arminio ottoman. Indulgentl.. Inches: 37” W x 37” D x 21” Holors:BisqueStyle:Traditional.. Crisp. Clean. Contemporary. If those words are music to your ears, the Kend..
Rolling out the red carpet, so to speak, with sumptuous cushioning and clas.. Inches: 35” W x 24” D x 19” HColors:SlateStyle:Contemporary.. Inches: 30” W x 24” D x 19” HColors:ChocolateStyle:Contemporary..